There are jobs that often go unnoticed by most of us. We probably don’t give a second thought about certain occupations as we go about our daily lives. Yet, all of us depend on people doing certain jobs day in and day out. These are the jobs that most of us would consider unpleasant and take for granted, except perhaps when things don’t work. For example, think about how often you flush a toilet, or run the washing machine, dishwasher or pour water down a drain. Every time you bathe or shower, the water has to go somewhere. All that wastewater has to be managed and processed before it returns to nature. That’s where the workers at Bossier City’s Wastewater Treatment Plant come in. Shawn Barton is the superintendent for wastewater treatment system operations in Bossier City. Barton started his career in sewerage and wastewater treatment 26 years ago and explains a lot has changed through the years and says people would be surprised at just how modern the treatment plants have become. 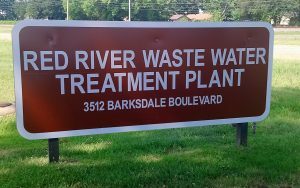 Bossier City has two wastewater treatment plants to handle everything that comes from neighborhoods, office buildings, stores and more. 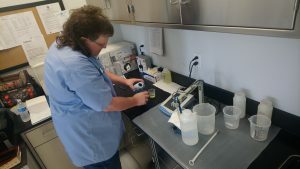 There is the northeast wastewater plant off Stockwell Road that treats about 2 million gallons of wastewater daily and the south plant of Barksdale Highway 71 South and it treats about 6 million gallons. Combined both plants have the capability of treating up to 18 million gallons to accommodate future growth. 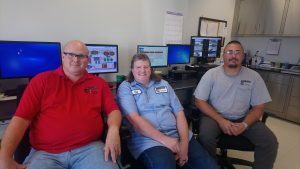 Both plants operate 24/7/365 days a year and are staffed around the clock. As the city started to have growing pains, so did the demand on the older plants to handle more wastewater. One noticeable problem was an increase in bad odors. Thanks to the upgrades, it’s a rare event when there is any unpleasant smell. Although automatic controls and sensors keep the plant running smoothly, there is still a need for humans to fix things. Arron Schwarz is the maintenance foreman and operator at the plant. He explains that although technology has taken over a lot of the functions, it still takes people to make the plant function. “There’s always something to work on or some maintenance to be performed to keep things running”, said Schwarz who took the job at the sewer plant in January when he retired after 20 years in the Air Force. While it has modern computer controls, he says it still needs people to perform basic functions. 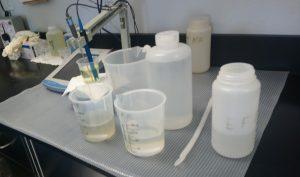 Water samples are taken and undergo a series of analysis checking for pH levels and microbial counts of good versus bad bacteria volumes. Guy Whitfield is a treatment plant senior operator and among his responsibilities is running tests on the plants treated wastewater. He’s been at this job for 15 years. In spite of all this high technology and modern plant efficiency, there still lingers one basic question: What is the biggest misconception the public has about this job? In fact about the only time a plant worker would get dirty is performing pump maintenance or equipment repair. So next time you do dishes, laundry, shower or flush, think where your wastewater goes and what happens next. It has to go somewhere and get treated before it returns to nature. Thankfully Bossier City has the professional staff and capable technology working around the clock to do just that.